Someone recently suggested to me that I write about the number of black-tie fundraiser galas that you can attend in Fort Mac every year. I have an admission to make - I've never really attended them, people. For most of my years in this community I have been immersed in raising my daughter, and the social scene whirled on without me. Now I find myself drawn to it, and into it, as my daughter is a bit older. This weekend I received an invitation to attend the RCMP Regimental Ball, and having never been felt it was an opportunity I couldn't pass up. The Regimental Ball is a fundraiser for our local Victim Services organization, a worthy cause if there ever was one. I have even contacted them in the past, not for help as a victim but for information, and they not only directed me to the appropriate source but did so promptly and with great professionalism. Victim Services are the ones who are there to help when there has been a crime or a tragedy that has left someone with their world shattered. They are the ones who comfort victims of sexual assault, and who accompany the RCMP when they must notify next-of-kin of an untimely or sudden death. They work very closely with our RCMP, and thus the association between them and their uniformed counterparts makes a great deal of sense in terms of the Regimental ball. I was told that the ball is a formal affair, and it is indeed. It was a chance to pull out a lovely gown and strappy silver sandals, and to see others decked out in their finest, too. I entered the Sawridge conference room and saw not just beautiful ice sculptures and fancy dressed tables but also a sea of red serge jackets. The RCMP Regimental Ball calls for full dress uniform, and so the conference room was filled to the brim with officers, male and female, young and old, wearing their finest. It was an impressive sight, and it actually startled me to see so many. I suppose I never realized how many RCMP officers work in this community, and how very young so many of them are. The ball is a formal affair in other respects, too, as there are toasts to the queen and speeches. I was touched by the table set for fallen officers, set aside as both a memorial and reminder of those who gave their lives in service. In this country we have in recent years lost many officers in tragic incidents that none will ever forget, and this poignant table is just one small way of ensuring they are remembered. 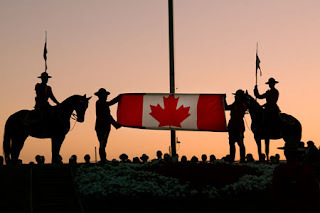 In the course of writing this blog I have made many new friends, and one is an RCMP officer. He is someone who has served the RCMP, and our country, for almost 23 years. He has become a friend, advisor, and even a bit of mentor for me in some ways. Until I met him I admit I had not given much thought to the role that police officers play in our lives, but after communicating with him I learned so very much about what they mean to us as a community, and as individuals. These are people who do a job that is quite often thankless, and who risk their lives on a regular basis. They are in a position that is heavily scrutinized and criticized, but are also expected and required to be willing to lay down their lives to save the lives of others. They are to some degree the glue that helps hold our community together, as they provide the stability and regulation a community requires to function. I thought of my friend a lot during the Regimental Ball. I thought of some of the stories he had shared with me, and realized that every man and woman in that red serge had similar stories. I thought about how they had most likely all faced moments that terrified them, moments that saddened them, and moments that had made them feel like they served their community well. I applauded when service commendations for excellent performance were awarded, and commendations for length of service. I watched the faces of the officers as they clapped and celebrated each other's achievements, and I thought about how these very same faces are the ones we see in the cruisers on our city streets. They are the ones who police our community. I've had few encounters with the officers who work in our city, but when I have they have been the utmost in professional and courteous (like the one who took the accident report when my car was damaged in a parking lot downtown, and handed me a kleenex when he saw I was about to cry). These are the faces we rely on in times of crisis, and I believe that we are in very good hands, people. I could talk about how great the food was at the ball, and how amazing everyone looked in their beautiful dresses and handsome suits. I could talk about the conference room transformed into a lovely vision of fancy tables and stunning ice sculptures. I could talk about the great company and fun conversation I had at my table, and I could talk about all the other aspects - but in my mind I keep coming back to those red serge jackets. I keep coming back to men and women who have chosen a profession that has great rewards but also tremendous personal demands - and a profession that sometimes even leads to loss of their own precious life in service to all of us. Today, September 11, 2011, I choose to write and celebrate not just a Regimental Ball but the people behind it. Today I choose to celebrate those individuals who have chosen to dedicate their lives to a profession with proud history and heritage, and to a non-profit organization who has volunteers who dedicate themselves to serving those in our community who have experienced a personal tragedy. Today I dedicate this blog to Fort McMurray Victim Services, a group who is there to help our community members at their most vulnerable and fragile moments, and to the RCMP of Wood Buffalo, who serve us day in and day out, and who freely risk their lives in order to better our community. They are true heroes, people. On today, of all days, I thank them for their service to us all, and I am so very happy I was able to attend the 2011 RCMP Regimental Ball to show them my gratitude in person.